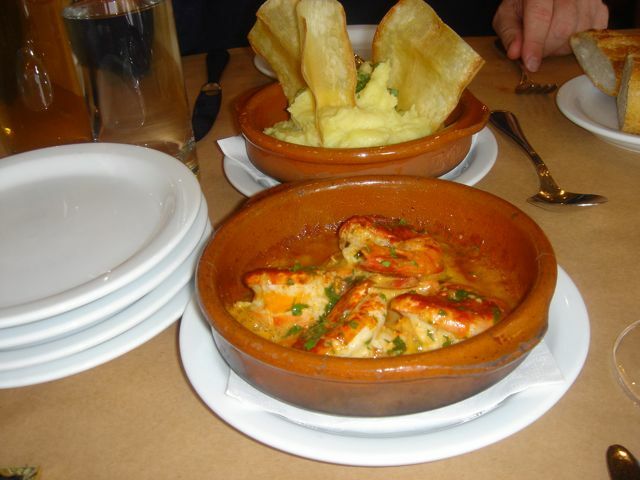 ZuZu is located in downtown Napa and bills itself as a tapas restaurant. The chef, Angela Tamura reinterprets Tapas by adding a California twist to taste elements from Brazil, Argentina, Spain, Portugal with a bit of the Mediterranean thrown in. The room is casual with a Mexican tin tile ceiling, exposed beams, Colonial tiles on the floor, a pine wood bar and wooden chairs with paper-covered tables. There is a no reservation policy and to be on the safe side we arrived at 11:30 as soon as they opened. Our server, Kenna was enthusiastic, very knowledgeable about the cuisine and as it turns out an artist whose works are featured on the wall. 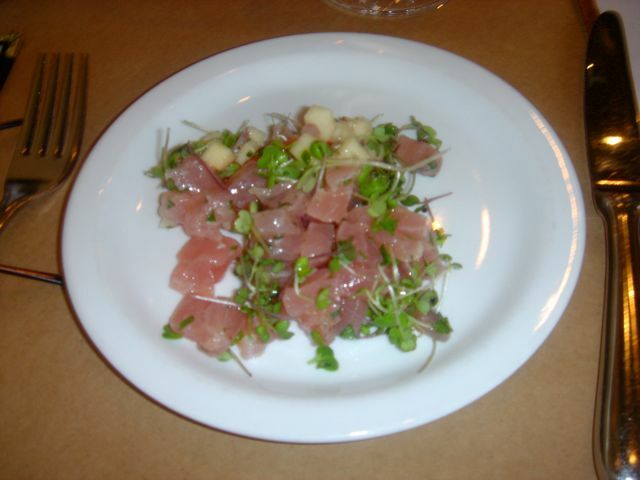 We started with their tartare special of the day — Ahi Tuna with Apple Salsa served in a martini glass. John dug into the dish before I could snap the original plating. This was excellent with good quality tuna in a rough chop/dice. The olive oil “dressing” is added seconds before service that avoids that swimming in oil disaster. The apple salsa was a particularly unique addition and one of the better tuna tartares I have had. Renna suggested that we order The Boniato, mashed and served with Yucca Chips at the same time. The prawns were served in a casserole and were actually sizzling on arrival. They were spicy, but not overpowering. This was one of the best dishes of our lunch. The Boniato, a Cuban Sweet Potato was delicious. It has such a natural sweetness that it mashed without butter or cream. 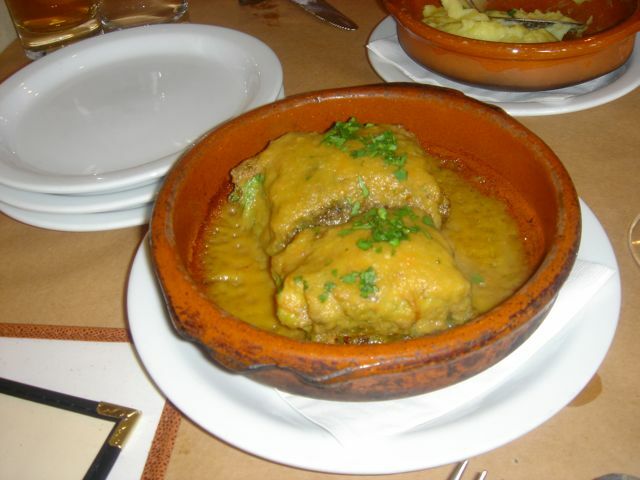 Catalan Cabbage Purses Stuffed with Pork sausage and Thyme. The cabbage is lightly breaded, fried and then finished in the oven. I loved this dish. 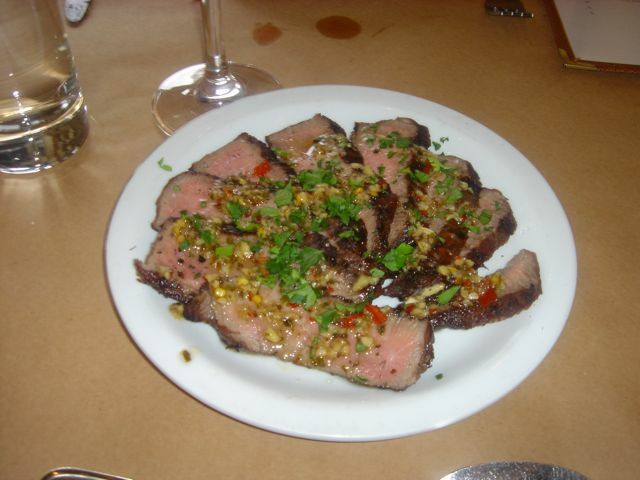 Argentine Marinated Flat iron Steak with Chimichurri – Basically if you are not a huge fan of garlic, this is not the dish for you. I love garlic, but, even for me, it was way too garlicky. This is one of those tastes that repeat and repeat and render your taste buds shot. We only took a few bites. 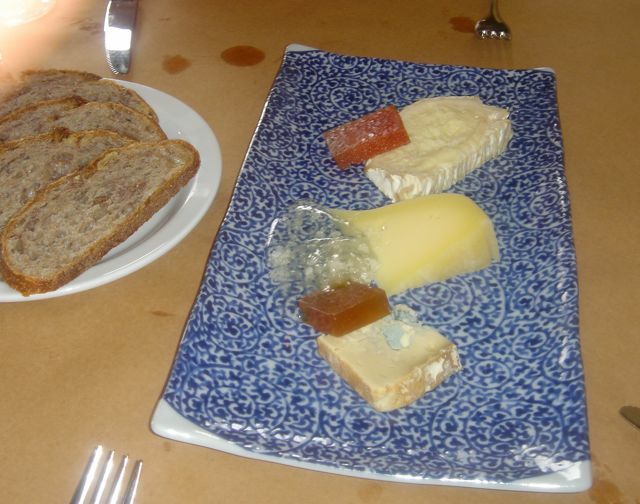 Artisan Spanish Cheeses with Quince Membrillo and Walnut Toast – The only cheese that I remember is the Manchego, although a goat cheese and a blue cheese (perhaps cabrales) was also served. 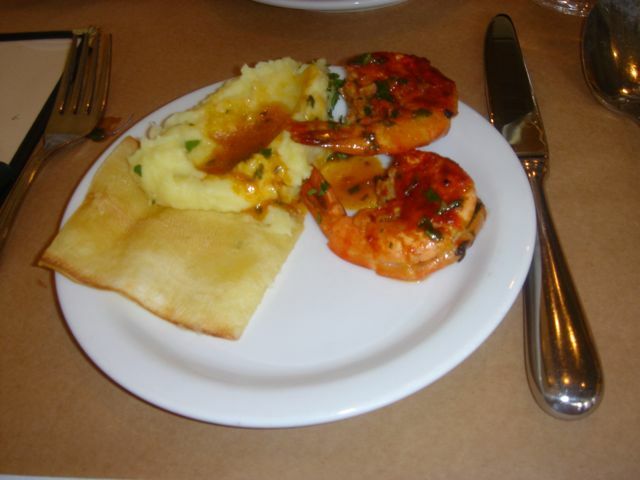 In retrospect, there were so many “goodies” on the menu that I wish we had foregone the steak and tried Renna’s recommendation of Pan Roasted Sea Bass with pepper Romesco Sauce. But we will definitely return and add on additional dishes. 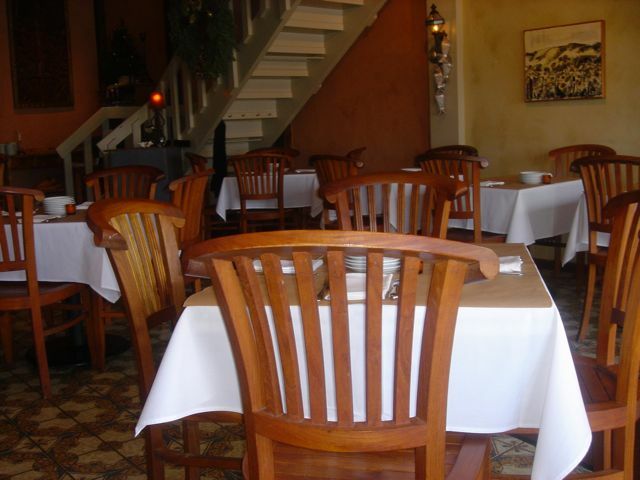 This is a keeper for a casual, fun dining experience. I don’t know what it would be like with the full bar scene at night and from what I understand as the long waits for a table given the no reservation policy. There is a communal table, however, on the loft.